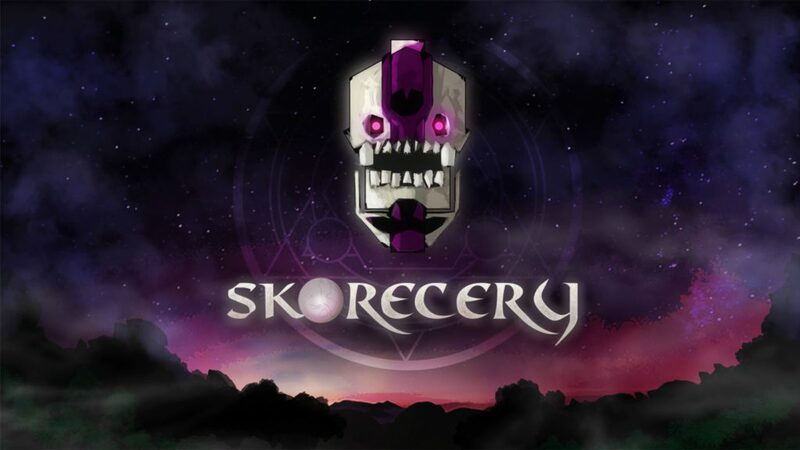 Skorecery is a local multiplayer sports-like game, developed by GrappleHook. In Skorecery, your goal is to destroy your opponent’s runes in a close-quarters arena. Grab up to three friends and challenge each other in this fast-paced sports game, available on PlayStation 4. Unfortunately, Skorecery does not have a story. The game could have benefitted a lot from at least something that resembles one. There are only two characters to play with; the Mystic, a guide between the worlds, and the Necromancer, a tortured spirit. These two characters must fight it out in an arena, orchestrated by a mysteriously sinister man, who looks rather modern-day-like in comparison to the overall theme of the game. Skorecery takes place in a vibrant mystical setting. The visuals are simple, on theme, and nicely animated. Aside from one medieval map, two characters with a nice vibrant aura to them, and flashy skulls floating in the air, there isn’t much more to discuss. The visual design shows some promise, but with the sheer lack of content, this leaves much to be desired. The music in this game is composed by Nick Bergen. There are only three main tracks; one during the opening title, one in the menus and one during the battle. The style of music fits the gameplay, but isn’t very special. You would not be able to differentiate this music with any of the many fantasy-type mobile games out there. Just like with the visuals of the game, what’s there is… ok, but there isn’t much there, and that can be said about the gameplay too. 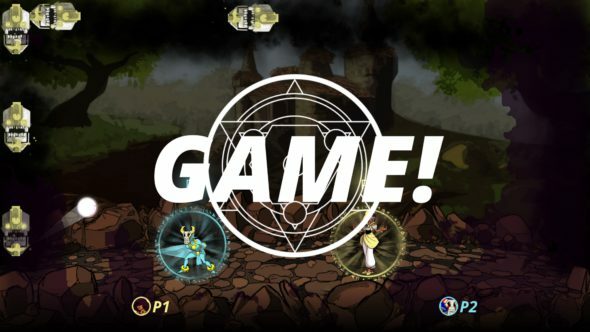 Skorecery is a fast-paced magical sports game with a host of modifier spells and curses, where your goal is to destroy your opponent’s runes, by smashing them with a ball. Although local multiplayer is always appreciated, and the option to play with up to four players is a refreshing one, the lack of an online platform, or a single player campaign, is what ultimately cripples this game. This game can only be played if you have at least one friend over, which isn’t always the case, and without that, this game is literally not playable. The game’s easy-to-learn controls make it accessible to pretty much everyone. This means you can easily play a couple of rounds with your kids, with your partner or with a bunch of friends. The game offers a couple of hours of fun before the lack of content will ultimately dismiss the game entirely. You will fight for the control of the ball, needed to smash your opponent’s stack of runes. Holding the ball for too long will cause you to release the ball, and leave you stunned for a short period of time. To grant you a slight advantage in grabbing and throwing the ball, you can switch your relative gravity, basically making you able to walk on the top of the screen. Markings around your character represent your Energy Glyph, and it tells you how much energy is left for your special spell. Your cool-down, however, prevents you from using that spell, even if you have enough energy available. Once one of your runes is destroyed, your energy will refill. There are a couple of different modes, but each plays out pretty much the same. The first is a default match, named Exhibition mode. The second, the Goaltender, is a timed mode, where runes will randomly appear on the map. 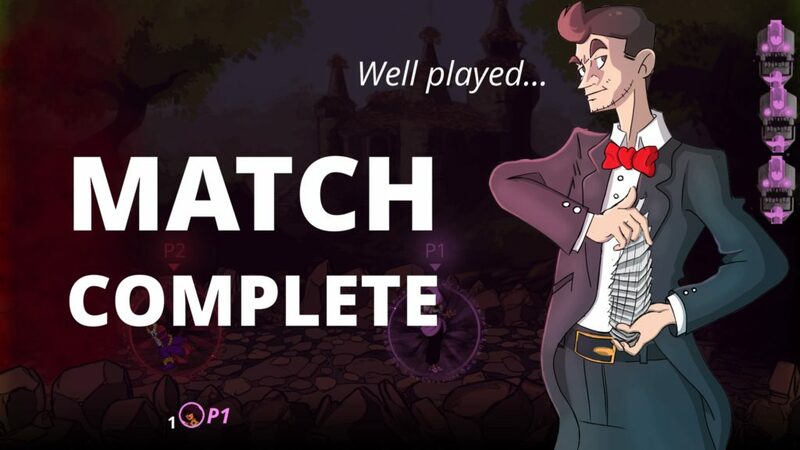 The player with the most points when the timer runs out, wins the game. The last variant is the Shootout mode, which plays out like an Exhibition mode, with the exception that each player will have limit of throws to work with. Each of these modes offer only a slight change to the default mode, but the game lacks a lot of creativity when it comes to the different type of game modes. 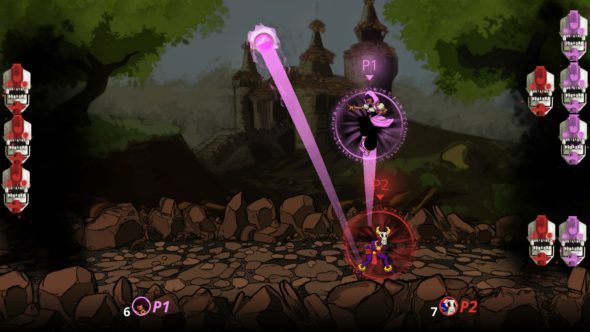 During a match, players can activate a special attack, a spell. 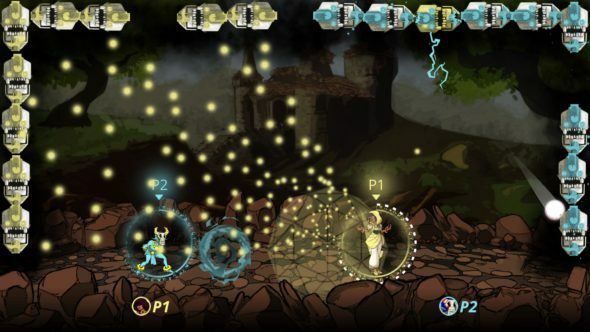 There are a number of spells to choose from during the character selection, such as; the Wall, which spawns a temporary force field, or Speed, making you move faster for a limited period of time, or Lockdown, locking the ball in place, and more. 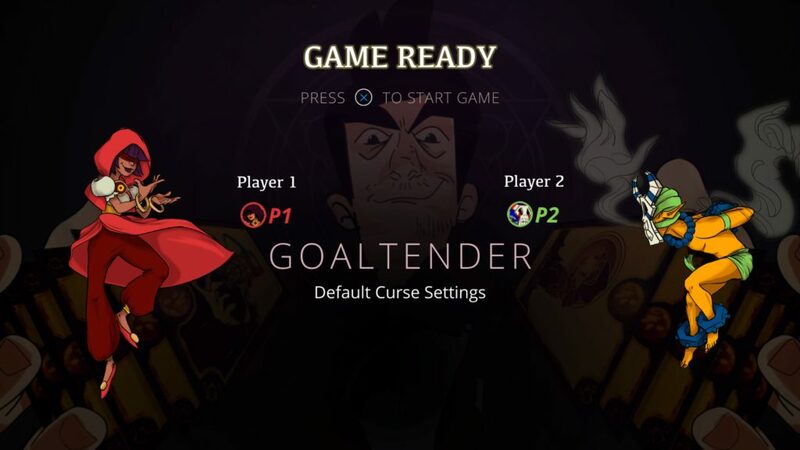 In the menus, you can go to the Curses tab. Here you can enable or disable modifiers to alter the playing field. These curses can range from changing how gravity works on the ball, changing the velocity and the ability to overcharge your throw, to enabling friendly fire and much more. This feature tries to spice up the game, but its impact does little on the overall enjoyment. Although the overall gameplay experience is okay at best, with a few fun moments here and there, it falls flat really quickly and without a solid core to fall back on, you are left with a shallow, empty shell of what could have been a fun game. You can run in some performance issues, and even the possibility of a game freeze. These technicalities may be fixed in a future patch, but with the little content this game has to offer, these are issues the game could definitely do without. Unfortunately, with the sheer lack of content, the state Skorecery is in at this moment, feels very lackluster. Without a single player option, or the ability to challenge people online, this games is a pain to actually play. There are only two playable characters, one map, and very repetitive gameplay, spread over similar game modes. The controls are easy and this game can offer a short-lived, but fun time with the kids, but that doesn’t even begin to justify a purchase. This game shows some potential, but at its current state, it is advised to skip this one altogether.